Swindon is a town with a reputation for stupidity when it comes to town planning and their roads in general. 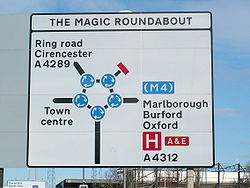 You need look no further than the unimaginatively named “Magic Roundabout” which was constructed in 1972 and consists of five mini-roundabouts arranged around a sixth central, anti-clockwise roundabout. In one opinion poll in 2005 it was voted the worst roundabout in Britain and then in 2009 in another poll it was voted the fourth scariest junction in Britain. However the up-side is that the roundabout provides a better throughput of traffic than other designs and has an excellent safety record, since traffic moves too slowly to do serious damage in the event of a collision. It is hardly surprising, therefore, that the local council are now under fire because of their latest initiative – a campaign to stop people illegally parking in alleyways. 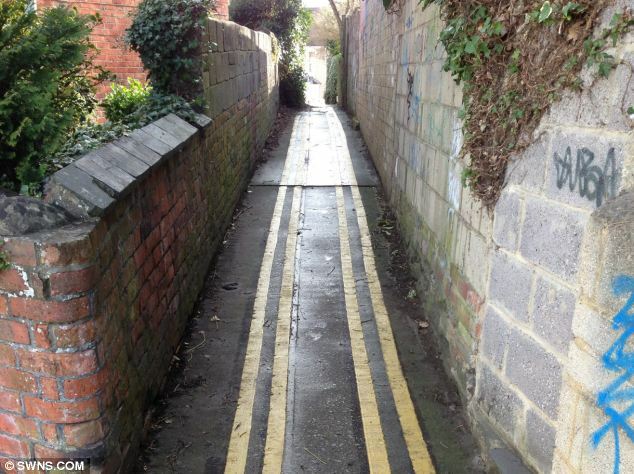 Bungling contractors have painted yellow lines down a narrow alleyway, leaving a gap of just 33cm in between them. The tiny alleyway itself is just 4 feet wide – too narrow for a car! Oh well, that’s alright then? No doubt the Council Tax payers of Swindon are delighted that their money is so well spent … BOING!!!!! Posted on April 16, 2013, in Film & TV, Jokes and Humour, Travel, Trivia and tagged alleyway, Boing, contractors, Council Tax, council tax payers, Magic Roundabout, mini roundabouts, Newhall Street, opinion poll, roundabout, Swindon, Wiltshire, yellow lines, Zebedee. Bookmark the permalink. 1 Comment.